Yesterday, Chris Jones, NGA’s VP of Government Relations & Counsel testified in a listening session at the USDA focused on Research, Education, and Economics programs. USDA hosted the listening session to give the public input on the Department’s work to implement the 2018 Farm Bill. The 2018 Farm Bill invested significantly more resources into the FINI program and thanks to NGA’s lobbying efforts, it directed more funding into grocery stores. Additionally, it established the creation of a Training and Technical Assistance (TA) Center to help retailers overcome challenges associated with implementing a FINI project. 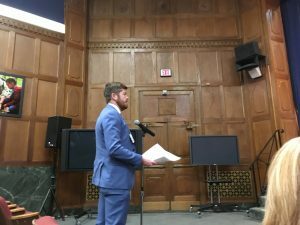 Chris’ comments outlined NGA’s priorities for the FINI program, including reinforcing the need for FINI grantees to direct more funding to grocery stores and to direct most of the TA resources to the establishment of a retail TA center. “Good Afternoon, my name is Chris Jones, VP of Government Relations & Counsel, at the National Grocers Association, or NGA. NGA represents the independent supermarket and wholesale industry. We appreciate this opportunity to provide comments to REE about the implementation of the 2018 Farm Bill. My comments will focus on one important aspect of the Farm Bill, the reauthorization and expansion of the Food Insecurity Nutrition Incentive program, or FINI, in Sec. 4205. NGA was pleased that the Farm Bill recognizes the need to incentivize healthy eating behaviors of SNAP recipients rather than impose restrictive mandates. The reauthorization is a major step in the right direction and improves on an already successful program. Thanks to NIFA’s successful FINI program implementation since it was first authorized in 2014, many of our members who were chosen as project partners are very happy with the results. By leveraging FINI dollars to offer their SNAP customers incentives for the purchase of fruits and vegetables, independent grocers are selling more healthy produce and their customers are making healthier shopping decisions. In grocery stores, these programs have been reported to bring in new clients previously not served, increase the inventory turnover of highly perishable fruits and vegetables and help the store procure more locally grown foods. NGA is excited that Congress prioritized retail project partners that can deliver fruits and vegetables year-round in subsection (b)(9). The Journal of Nutrition Education and Behavior recently recognized the need for shoppers to have year-round access to incentives to maximize positive long-term behavioral results. The Journal said that farmers markets, who currently receive the most FINI funding, are difficult to get to and “because farmers markets do not provide the same one stop shopping environment as grocery stores, this might inhibit shoppers from incorporating farmers markets into their shopping routine.” As NIFA works to develop the next FINI RFA for 2019, we recommend it strongly reinforce the need for grantees to fund more FINI projects in grocery stores. Secondly, NGA is very happy that the Farm Bill addresses many of the FINI implementation challenges experienced by grocery stores. In subsection (e) the bill establishes a Training and Technical Assistance center to help project partners implement a successful FINI initiative. NGA members consistently note that challenges associated with transaction processing technology at checkout is the primary barrier to their store’s participation. The Managers’ report noted this and requested that the TA center proactively engage with the technology companies our members already use for checkout to help reduce the high costs and administrative burden that has come with grocer participation in this program to-date.